January 17, 2019 – Now on view in Mount Vernon’s Donald W. Reynolds Education Center is a special temporary exhibition featuring 30 rare medals from the American Revolution and the early republic. “War and Peace in Miniature: Medals from the American Numismatic Society” is an unparalleled collection that highlights the remarkable heroes and events from the Revolutionary War and the new nation’s diplomatic endeavors. William Washington / Battle of the Cowpens. Early restrike from original dies. 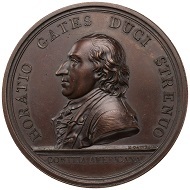 AE bronze medal. 1781. 45 mm. At the center of the display are 11 silver, bronze, and copper medals awarded by the Continental Congress to honor military commanders who bested their British opponents. Produced in Paris, leading engravers created complex images on a tiny scale (no more than two inches in diameter), with bust portraits, classical allegories, and vivid battle scenes filled with booming cannon, charging horses, valiant soldiers, a warship, and a fort. George Washington. Silver Medal. 1776. 68 mm. 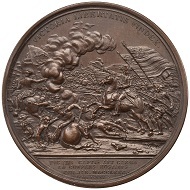 Not surprisingly, the very first of these medals – known as the Comitia Americana or American Congress series – went to George Washington for relieving the British siege of Boston in March 1776, three months before the Declaration of Independence. George III. Indian Peace Silver Medal. 79 mm. 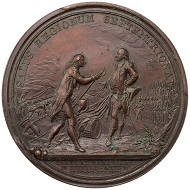 A second series of medals embodies the new nation’s peacetime efforts to enter the international stage via diplomacy and trade, with both European nations to the east and Native American nations to the west. 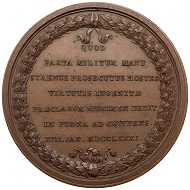 Six rare examples of “Indian Peace medals” from George Washington’s administration exemplify his efforts to adapt monarchical precedents to republican ideals. George Washington. Indian Peace Silver Medal. 1789. 137 x 106 mm. 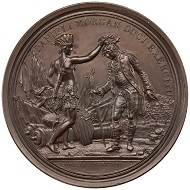 Instead of the king’s portrait featured on English medals, the first US “Indian Peace medals” featured images of a Native American leader sharing a peace pipe with a Roman goddess (later replaced by a uniformed figure of a President). A trio of medals, designed by noted painter John Trumbull, promoted the benefits of settled agriculture, with images of a farmer sowing seed, a herdsman and his livestock, and a woman spinning by fireside. George Washington. Silver Medal. 1793. 175 x 127 mm. Horatio Gates / Battle of Saratoga. Restrike from original dies. 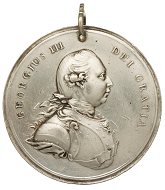 Bronze medal.1777. 55 mm. An interactive touchscreen next to the display of medals invites visitors to explore these meticulously-crafted objects in more detail. The touchscreen features high-resolution images of the front and back of each medal, as well as additional details about inscriptions and symbolism. Silver Medal. 1780. 62 x42 mm. 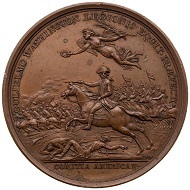 The exhibition also recalls Washington’s own collection of medals. 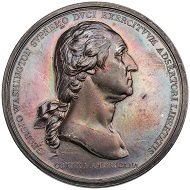 At the time of his death in 1799, he owned an unequaled assemblage of the new nation’s medallic art – including the only full set of the Comitia Americana series – stored with other valuables and curiosities, probably in a small closet off his study. Daniel Morgan/Battle of Cowpens. 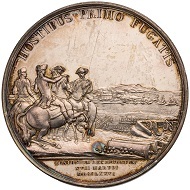 Bronze Medal. 1781. 56 mm. “War and Peace in Miniature: Medals from the American Numismatic Society” will be on view through March 31, 2020. For more details, please visit the George Washington’s Mount Vernon website.